Last week, the latest addition to the Stirling Smith collections was unveiled by Stephen Kerr MP. 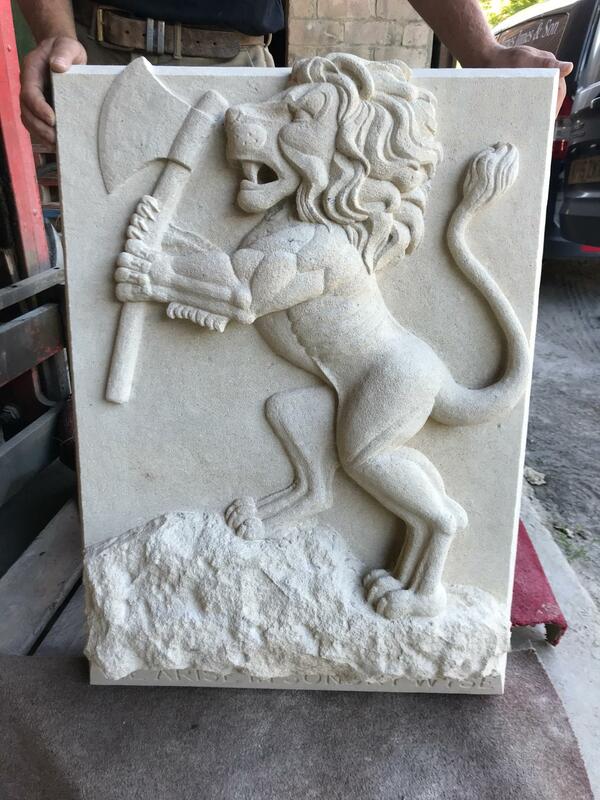 It is a reproduction of a long-lost Raploch stone, re-carved anew by stonemasons James Innes & Son of Doune. The original stone was on a tenement in Back O’Hill Road / Albany Crescent, designed by architect John Allan, built in 1896, demolished in 1965. The companion stone, a ‘magic square’ where the numbers add up to 18 on all sides, has also been re-carved for the Smith. The ‘magic square’ with the injunction ‘Whate’er thou art, act well thy part’ inspired a young Mormon missionary, David O McKay visiting Stirling in 1897 to do his best in his work. He made the stone world – famous in his teaching, as he rose to become the ninth President of the Church. The stone was purchased and taken to Salt Lake City, Utah in the 1960s. Both stones have been re-carved in limestone for the Smith. Until now, the only known lion in Raploch was that of St Mark’s Church. This lion is older, referencing King James I who beheaded the Duke of Albany in 1425 on the Heading Stone on Gowanhill. Albany had kept James an English prisoner for 18 years, refusing to pay the ransom. John Allan had designed the protective cage for the heading stone in 1887 and referenced the story in his buildings of 1896. The puzzle was unravelled by church historian Mandy Watson and is explained in a beautiful new exhibit at the Smith.